Seventy years ago today, as I write this, in the cold and dark waters of the North Atlantic, the first American warship was sunk in World War II. It is generally forgotten today that prior to Pearl Harbor the people of the United States wanted very little to do with another war in Europe, as the First World War was seen as many to have served the purposes of the power elite far more than the people. Many among the interventionists who wanted immediate American involvement in the war tried to use the sinking of the James as a causus belli. 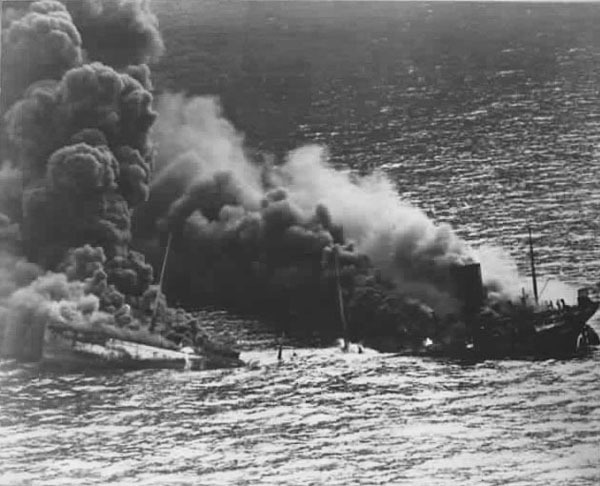 Woodie Guthrie (little remembered today, but whose son Arlo eventually would write about littering on Thanksgiving) wrote a famous ballad about the sinking. Unfortunately, from an American P.R. point of view, it did not work. The 115 who were lost were the first American casualties of the war. Woodie Guthrie or no, however, their deaths did not have the effect of mobilizing American involvement. A movement might have coalesced around the sinking, but history had other ideas. The incident that would mark the world forever would not come for another five weeks, when the Japanese struck at Pearl Harbor. And in the smoke of Pearl Harbor, the sinking of the James was eventually forgotten in the United States. So today, take a moment and remember these forgotten men, who lost their lives for our freedom seventy years ago today.